You need to try the amazing Beauty Abounds bundle! 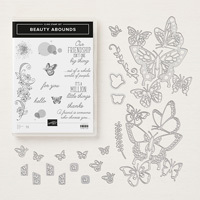 Today I am going to reintroduce the Beauty Abounds stamp set and partner it with the Butterfly Beauty thinlits dies to make a beautiful 'hello' card. Butterflies are all the rage in the crafting world this year and I know this bundle will be a hot selling item in the Occasions catalog. So let me show you one card idea and how to make some magic with the framelits. Beyond these two items you can use what you have on hand for embellishments. I have listed what I used below and have also made a video so you can see my steps. Don't miss the extra tips in my video! Needlepoint Nook designer series paper (148807): 4" x 5 1/4"
Here's my video - have a look and then please answer my question below - I love hearing from you! What two colors would YOU use for this butterfly duo? Leave me a comment below to let me know - I am always looking for new ideas to try, including color combos! Wow, Mo3 - thank you so much. What an honor! I will be back again next week, this time with a scrapbook page idea to share. Just stopping back by to let you know this card was picked as one of my featured favorites from the Encouraging Hearts and Home party. Thanks so much for linking up with us! Hi Mo3! 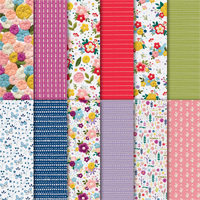 Thanks for you comment - I also love butterflies and know that this bundle will be super popular with all crafters. The next time I craft using Beauty Abounds, I will try your softer color preference and see how that turns out. Simply beautiful! I love butterflies and tend to have lots of butterfly stamps and punches... but I don't have this set! I tend to use lots of peaches, light pinks and pale greens but I love this contrast! Pinned.